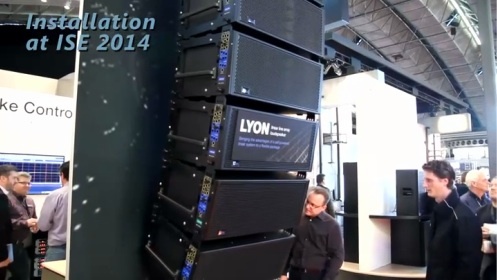 ISE 2014 saw the trade show premiere of the self-powered LYON linear sound reinforcement system, the newest addition to the LEO family of linear loudspeaker products from Meyer Sound. By incorporating the technology of the LEO Family in a lighter and more compact package, Meyer Sound believes that the LYON line array loudspeaker system extends the advantages of highly linear self-powered systems to a broader range of venues and applications. LYON is available in two versions: the LYON-M main loudspeaker and the LYON-W wide-coverage loudspeaker. Complemented by the 1100-LFC low-frequency control element and the Galileo Callisto loudspeaker management system, the LYON-M main loudspeaker is designed to anchor a powerful system for installations in arenas and large auditoriums, as well as tours and festivals. The LYON-W can serve as down fills to augment a LYON-based system. Both LYON versions can be used to provide supplemental coverage in a LEO system. On the second day of ISE 2014, Meyer Sound announced that Dutch rental company Bazelmans AVR had become one of the first suppliers of the new product. The deal includes 40 LYON linear line array loudspeakers, 22 1100-LFC low-frequency control elements, and a Galileo Callisto loudspeaker management system, in addition to RMServers for loudspeaker monitoring.